We’ve all seen it just about everywhere and it’s been around for nearly all of America’s history. All around the world since humans first started recording history, people have partaken in some kind of tobacco. Whether it’s in the form of cigars, cigarettes, chewing tobacco, or something else, tobacco can be harmful when ingested by humans. 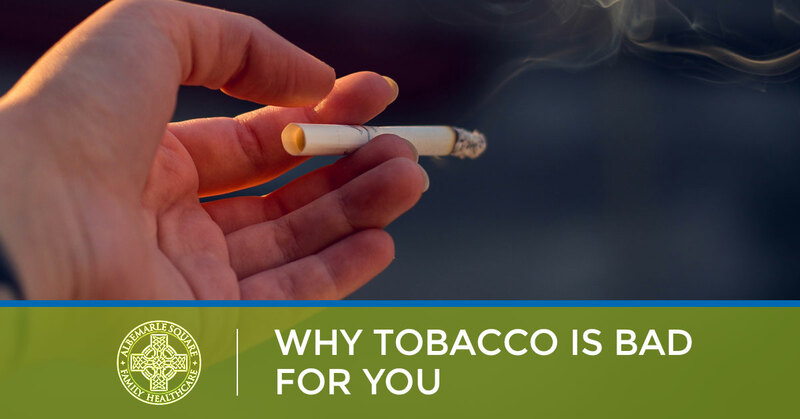 In today’s blog, Albemarle Square Family Health, the leading family health center in Charlottesville, will go over why tobacco in all of its forms is harmful to humans and why you should stay away from smoking or chewing it. Tobacco by itself isn’t very healthy for you. However, when you use cigarettes, cigars, and other forms of pre-processed tobacco, you’re putting a whole lot of other things in your body. Aside from the pesticides and growth hormones companies put in the tobacco plants, you’re also inhaling and possibly ingesting many harmful chemicals from the additives in cigarettes. Chemicals like arsenic, which is used in rat poison, butane, a common lighter fluid, and lead, a heavy metal with harmful side effects for humans, are all found in common cigarettes. It doesn’t matter if you’re smoking filtered or unfiltered cigarettes, hand-rolled or all-natural cigars, these chemicals are present and will cause problems for you down the road. One of the worst additives in cigarettes, cigars, and other forms of tobacco is nicotine. Nicotine is commonly used as an insecticide, but it’s also a highly addictive chemical that keeps people hooked on tobacco products for a lifetime. Nicotine can also be found in the quit smoking gum and patches that are marketed as ways to, well, stop smoking. But because the drug is still present in your system, you’ll still crave it no matter what form it comes in. Most e-cigarettes and vapes have nicotine in them as well, with one cartridge containing up to about two packs of cigarettes worth of nicotine. While no way of partaking in tobacco is healthy, smoking may just be the worst. Smoking tobacco, such as cigarettes, cigars, pipe tobacco, and more, introduces all of the harmful chemicals we detailed above, and more, to your entire body via your lungs. Your lungs are some of the most susceptible organs in your body, and smoking tobacco is one of the easiest ways to harm them. Tar from cigarettes and cigars will collect in your lungs and will limit your organ’s ability to expand and contract. Smoking tobacco in any form is also a well-known carcinogen, meaning that it can cause cancer to form in your lungs. Chewing tobacco poses its own risks as well. While your lungs may be spared, your mouth and stomach won’t be. Chewing tobacco can cause gum disease along with other dental problems. Ulcers, tumors, and cancer may even develop in your mouth, throat, and stomach over time while you use chewing tobacco, all of which can be extremely difficult to treat. If you ingest your saliva while you use chewing tobacco, or you swallow the chewing tobacco itself, you run the risk of developing stomach problems, some of the worst being ulcers and cancer. While you may think that you’re the only one who will suffer from using tobacco, smoking tobacco actually has the potential to harm others as long as they’re in the vicinity when you use them. Second-hand smoke has been known to cause health problems in kids and teens, even though they aren’t the ones who are smoking. Even the smallest amount of smoke from tobacco can cause major problems for kids as they’re bodies are still developing. Pets are also susceptible to tobacco smoke as second-hand smoke has been shown to cause the same problems in dogs and cats as humans. Your walls are even harmed by tobacco smoke as the chemicals can seep into your drywall, causing it to change color and absorb the smell from your tobacco products. All forms of tobacco are harmful to everyone, no matter how you use them. If you want more information about tobacco use, the primary care physicians at Albemarle Square Family Health are more than happy to help you. Learn more about Albemarle Square, see what kind of services we can offer you and your family, or contact Albemarle today to answer any questions and schedule your next appointment.